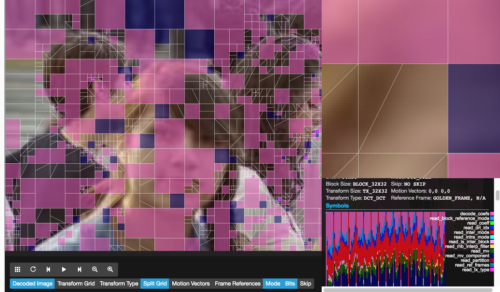 Michael Bebenita, a Research Engineer at Mozilla, recently posted a fascinating article on the development of AV1, a next-generation video codec. If you’re interested in how new media formats are created, I highly recommend reading the full article. The input to the analyzer is usually small (an encoded bitstream), but the output is very large. […] The ideal solution is to run the analyzer directly in the browser and thus eliminate the need to download analyzer output. Fortunately, Emscripten already has experimental support for compiling to WebAssembly, so the AV1 workflow will remain the same: develop a single codebase in C and use Emscripten to compile that to the Web for testing. In this way, WebAssembly will play an integral role in the development of next generation video codecs.